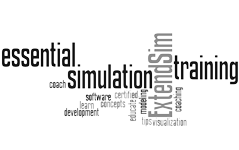 Put yourself on a faster track and learn how to build simulation models using ExtendSim in this 4 day hands-on workshop. Basics of discrete event simulation will be covered plus you'll get an essential understanding of the ExtendSim architecture. By the end of the course, you will feel confident in building ExtendSim models and have your eyes opened to the powerful tools that can be quickly used for in-depth model analysis. You will be working on a Windows laptop so you must have basic Window computer skills. Knowledge of basic statistics (random distributions and confidence intervals) is recommended. Before your first day of class, it will be extremely helpful if you familiarize yourself with ExtendSim. If you have not already done so, please go through the Tutorials in the Discrete Event Quick Start Guide or watch its video. $2500 for the 4 day workshop. Nestled within the south of the Silicon Valley, surrounded by several world class golf courses, beautiful walking trails and some of the valley’s largest high tech companies you will find ‘Not just a room but a Residence” where you can thrive on long stays at the Residence Inn San Jose South.